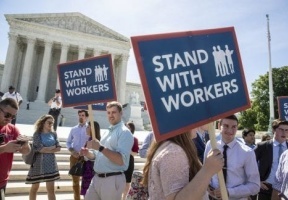 The U.S. Supreme Court on Wednesday handed a profound setback for union members as they voted 5-4 in the case, Janus v. the American Federation of State, County, and Municipal Employees Council 31, ruling that public sector workers who are represented by unions cannot be required to pay any union dues. The Janus case was originally prompted by Illinois’ governor, Bruce Rauner, as part of a national effort to challenge a national teachers’ movement against austerity, de-fund public sector unions, divest from working class communities of color and undercut workers’ rights. Upon the announcement, Gov. Rauner released a statement to the press, stating “For decades, Illinois workers have been forced to pay partial union dues against their will. 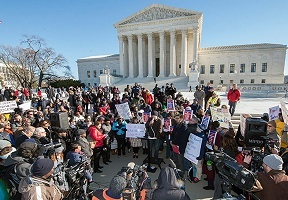 The practice infringed on the constitutional rights of public sector workers who were asked to give up their First Amendment rights as a condition of employment. This decision fairly reinstates those rights.” However, several opponents voiced their disappointment in the ruling.